Coconut crabs | Random moosages as I see fit. Have you ever heard of coconut crabs? The first time I saw/heard of one, I thought it was a joke. Because…srsly? Look at that! The thing is about the same size as the trash can! And no, as far as I can tell, it’s not a tiny trash can. They aren’t as heavy as Yaris though. Yaris is now at a svelte 55ish lbs. A coconut crab with the dimensions described above would probably be about 9 lbs. Can you imagine a 9 lb crab on your plate for dinner? It wouldn’t even be a plate. It would have to be a platter. A platter holding a single crab. And you have to eat it all. Gosh, why are you such a piggy? But anyway, you probably won’t find any here (by which I mean the continental US). 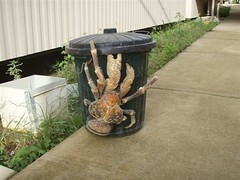 Coconut crabs are found on coasts in the Pacific and Indian Oceans, but not all the way out to the continental States. It’s sad that they also don’t exist in wherever my Animal Crossing town is. Actually, coconut crabs only made it into one game, I think. I guess I won’t get to see one of these things up close any time soon.